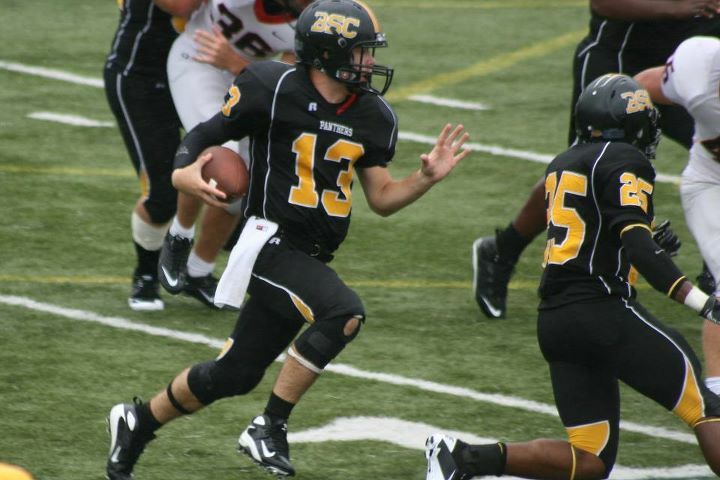 Former North Georgia Falcon quarterback, Tim Howard, led the Birmingham Southern JV team to 23-20 victory over LaGrange College in his first college game as the starting quarterback on Sunday, Septem ber 4, 2011. BSU runs the Oregon (no huddle) spread. The homeschooled Saints reigned supreme in the national tournament in Florida. 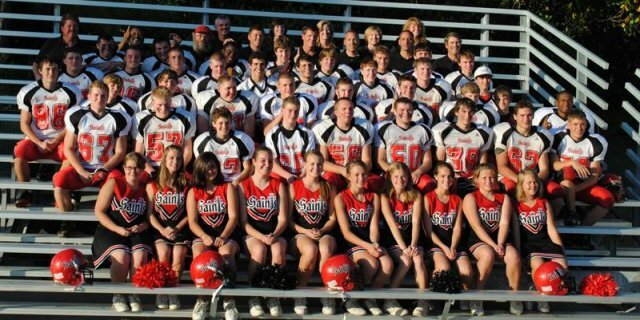 Not many people know, but Maryland is home to a new national champion: the Maryland Christian Saints football team. Often, the Baltimore sports community sees the top teams as either being the private schools of the MIAA and IAAM, or the top public schools of the MPSSAA, but hardly ever are the home-schooled teams given a thought. Maryland Christian is looking to put a stop to that. Going a perfect 11-0 in their battles against the teams of the MIAA, WCAC and Mid-Atlantic Christian Football Conference, the Saints earned a berth to the National Homeschool Football Association’s national tournament in Panama City Beach, Fla., where they topped two more national representatives for the 2010 national title. “I’ve learned a lot of the years of coaching, and one of the things I’ve learned is that you can’t play to not lose, you have to play to win,” Saints’ coach Tony DiPaola said. “We go out there and we’re throwing the ball when they aren’t expecting it, and we surprised both teams. The Saints had a tough road to the championship in their first ever invite to the national championship tournament, and knocked-off two- time defending champ Lighthouse Christian (MO), 38-6, and then defeated the previously undefeated North Georgia Falcons (11-1), 35-2, to win the NHFA crown. Rushing to a 26-0 lead as early as the first quarter of their Thursday semifinal game with Lighthouse Christian, the Saint defense held a strong shutout till the last play of the game for the 38-6 final. Defense has been a point of pride for the Saints all season, opening the year with three shutouts and allowing just 120 points in 13 games. Helping lead the defense was junior Will Carlton, the 6-2, 230-pound double-digit sacking machine, and junior teammate Evan Chase, the 6-2, 220-pound middle linebacker whose father played in the NFL. The Saints only allowed two more points in the national tournament, giving up a holding-penalty safety in their 35-2 win over the Falcons. The Falcons scored 52 points in their semifinal win. “We can run and pass the ball, so, if a team puts eight in the box, our quarterback can audible at the line, and that really helps us out,” DiPaola said of junior quarterback Christian DiPaola, throwing nine touchdowns in the national tournament. Catching seven of those scoring passes was senior wideout Jed Yousefi, who will be one of just eight seniors leaving the Saints. Yousefi brought in 47 receptions for more than 1,100 yards and 30 touchdowns, while returning punts and interceptions for scores, as well. The Saints made up nearly half of the tournament’s honor roll, placing nine of the 22 players on the list. Every national tournament holds with it an All-Tournament team, and the Saints players made up nearly half of the 22-man roster. Along side DiPaola, Yousefi, Carlton and Chase were juniors Johnny Lewis, Caleb Gordon, sophomores Alex Dowling and Austin Lee and senior Brian Wilt. “These guys are truly Division I and Division II caliber prospects,” DiPaola explained, citing Carlton’s probable move as a college defensive end, Chase’s frame and Christian DiPaola’s 6-4, 212-pound body that threw 38 touchdowns to just eight interceptions. “Chase is 6-2, 220… that’s NFL size, and Christian’s 38 touchdowns to eight interceptions, that’s big-time numbers,” adding that Christian threw for more than 2,300 yards in the year. One player who dominated through the season without making the All-Tournament status was junior Michael James, rushing for 981 yards and 13 touchdowns in 2010. “I was tearing up when thy announced them,” DiPaola said. “The tournament director was just throwing accolades and said how our team was invited to the national championships. He said when he as in high school, he had a coach that said to leave no doubt, and that Maryland Christian left no doubt they were the number on team in the county. “We are going to try and go down there next year. It is a long ride, that’s all I can tell ya,” he laughed. Junior Christian DiPaola was a big part of the Saints’ offense, throwing from more than 2,300 yards in 2010. The Saints played three games in seven days to reach national champion status, including their Mid-Atlantic Christian Conference championship game the previous Saturday, topping Central Virginia, 28-20. “It was a lot on them, but it wasn’t as tough on them as I thought it would be. We were able to sub and move players a round, so we didn’t wear them out,” said DiPaola. But the blood really boils between Maryland Christian and Central Virginia as the two teams have been knocking heads in back-to-back conference championships. “The emotion was very high because we beat them in the last regular season and they beat us in the championship,” DiPaola said. “This season, we beat them in the regular season and that was their only loss in the conference. Central Virgina eventually led the game 20-7 in the third quarter, shuting down the Saints’ running game and forcing them to take to the air. No Problem for Christian DiPaola, who threw for 366 yards in the comeback win. According to Curley head coach Sean Murphy, who guided his team all the way to the B Conference title game, the Saints are legit. DiPaola hopes that win and his team’s national title will change the way homeschool programs are viewed. “I don’t think people realize how good the homeschooled football teams are now,” DiPaola suggested. “I would pit it out there that Central Virginia and the other two teams down [in the national tournament] would win the MIAA B conference, and we would be the middle of the pack or upper ranks of the MIAA A conference. In Louisiana and other parts of the country, homeschooled football players and teams are striving for recognition and opportunity. Despite playing quarterback for a homeschool football team in Louisiana, the 6-foot-4, 190-pound junior is making inroads toward earning a Division I college scholarship. 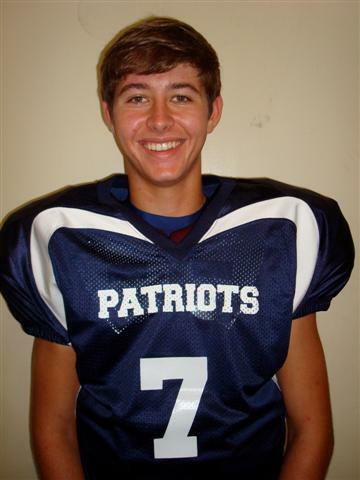 Douglas, who lives in Clinton, is beginning his sixth year as the starting quarterback for the Baton Rouge Christian Patriots. Last year – when the team was winless in nine games against its toughest-ever competition – Douglas completed 73-of-195 passes for 647 yards and four touchdowns in a run-oriented offense. He also threw 10 interceptions. When he was in eighth and ninth grade, though, his team compiled a combined 14-3 record and twice won the championship in the Louisiana Christian Schools Athletic Association. Still, it isn’t easy when close to half of his team graduates every year – and almost none of the newcomers have played football before. Therefore, he not only has to work hard to improve his own talents, but by necessity also must fulfill a major coaching role. This year’s team has 20 players and a 10-game schedule. For the first time, three of the players are not homeschooled. It has no home field, so games are spread around the Baton Rouge area. Opponents include several teams from the Mississippi Private School Association. Crowds range from 150 to 500. Steve Douglas, who put a nerf football in his son’s hands five minutes after he was born, has done everything he can to direct him toward a college football career. That means sending him to every camp and combine that he can find to achieve maximum exposure. The big one so far has been the Dave Schuman National Underclassmen Combine in Baton Rouge. He played so well that he earned sophomore MVP honors over many more experienced players. Needless to say, he was shocked when he was named overall combine MVP in the sophomore class. Douglas at National Underclassmen Combine. Director Dave Schuman told MaxPreps, “I didn’t know anything about him. I was actually surprised he was homeschooled. He was spectacular in individual and one-on-one passing drills. He has amazing footwork. He has a spectacular delivery and gets it out of his hands very quickly and on a rope. Therefore, he’s already attended camps at Mississippi, Vanderbilt, Southeastern Louisiana and LSU. He also has taken an unofficial visit to Wake Forest. At the nearby LSU camp, offensive coordinator Gary Crowton “was very encouraging,” Douglas recalled, even though he played with an injured ring finger on his passing hand. His desire this year actually was to play for a regular school for the first time in his life, but it didn’t happen. Nearby Clinton will not accept homeschooled athletes. He also approached Christian Life Academy, but state rules would force him to sit out his junior year because he does not live within the school’s boundaries. He has received correspondence from such colleges as UCLA, Hawaii, Memphis, Alabama, Mississippi and LSU, but the big question always lingers about his competition. He carries a 3.65 GPA and needs just eight more credits over the next two years to earn his high school diploma. He’ll also be taking some college courses before he graduates. Meanwhile, the talented teenager will continue to work with his private coach, Don Griffin, who operates Don Griffin’s 18:21 Skills Camp. When he first met Douglas, one and one-half years ago, Griffin “immediately noticed his great gifting and potential, but he was raw. He needed a little tweaking. During instructions, he always said, ‘yes, sir’ and he could execute. He listens so well and would do it on the next repetition. He has a great ability to translate information. He also has the ability to self correct. “Footwork was first. It’s the most important thing for the quarterback – feet are everything. He’s gained greater control of where to place his feet. On another occasion the teenage workhorse drove 50 miles right after competing in a camp at Southeastern Louisiana to take part in Griffin’s drills at 5 p.m.
Griffin estimates that he’s forced Douglas to leave workouts “four or five times. A lot of that is work ethic, but if somebody wants him to stay late (and throw to them), he just wants to serve. We work very, very hard. The quarterback throws 300 balls. Home-school high school football is not well known around the United States, but it is beginning to emerge from the shadows. There actually is a small “hotbed” based in the Atlanta, Ga., metro area with eight teams making up the Glory For Christ Football League. Four of them are strictly home-school teams and four are private Christian schools which allow home-schooled players to participate. The potential pool is large because an estimated 100,000 students are home-schooled in Georgia. Director Hank St. Denis started the program seven years ago as the Georgia Football League. He told MaxPreps there are an estimated 400 players participating this fall. They represent the cities of Cartersville, Canton, Dalton, Buford, Conyers, Marietta (two teams) and Roopville. The first year he had just one team, but the league ballooned to eight the very next year. He estimates that the league has produced “around 10” players who since have participated in college football at some level. St. Denis says his program is necessary after athletes out-grow the younger recreational leagues “because the Georgia high school association doesn’t allow home-schooled players to play for public high schools. In high school, all kids want to play sports. Football is a huge draw in the state of Georgia. A lot of parents ended up putting their kids in public schools just to play football. St. Denis believes that Maryland and Virginia have enough teams to form a combined eight-team league of their own. Last year, St. Denis started the National Home-School Football Association Tournament, which was held at Panama City Beach, Fla. There were five high school and three JV-middle school entries. This year’s national tourney will return to Panama City Beach, Fla., and will run from Nov. 18-22. St. Denis hopes to have entries from Michigan, Missouri, Georgia, Virginia and Louisiana. He also is inviting teams from Texas, Oklahoma, Ohio, Indiana and Wisconsin. Stevie Douglas from the CHEF Patriots (Baton Rouge) Article from MaxPreps.com about quarterback Stevie Douglas, who plays for the CHEF Patriots from Baton Rouge, Louisiana. The article also talks about the National Homeschool Football Tournament. BALL GROUND, Ga. — By 2002, the sports-loving sons of Roger and Diana McDaniel had aged out of recreation league football. A school team was not an option. They had no school. The boys were educated at home, cracking open textbooks — English, math, Bible — about a first-down-marker’s length from their bedroom. So the McDaniels huddled with two other families and formed a team of 18 players ages 12 to 18. Blessings fell at their feet. A college abandoned football and provided affordable uniforms and gear. A private high school canceled its season, and the team, now called the North Georgia Falcons, assumed the schedule. From that small seed has sprouted the Glory for Christ Football League, eight teams composed of home-schoolers and students at small Christian academies. The ranks of the home-schooled grew to 1.5 million nationally through 2007, up from 850,000 in 1999, when the Department of Education started keeping the statistic. Sports participation has bloomed accordingly, though football has lagged because it requires more players, coaches, equipment and facilities. Georgia, with its abundance of football and religious fervor, has become a petri dish. Texas and this shiny buckle of the Bible Belt have the most registered football organizations with the Home School Sports Network, a national umbrella. Spurring the growth in Georgia is a stipulation that only enrolled students can take part in sports at member schools of the Georgia High School Association. Early on, Diana McDaniel lobbied the state assembly and education board to open the stadiums and gyms to the home-schooled. The association stood its ground, maintaining that eligibility abuses and improper recruiting could flourish. Twenty-four states allow the home-educated to join public- or private-school teams, according to the National Federation of State High School Associations, and the number is growing. The McDaniels and others have since warmed to Georgia’s policy, content to operate independently and set their own bylaws. Glory for Christ has hung a “no girls allowed” sign that contrasts with the state association’s policy. Many of the league’s goals seem out of step in a state where high school coaches draw six-figure salaries and where booster clubs raise money for expansive stadiums and fancy scoreboards. The notion that home-schoolers wanted to play football was largely foreign until quarterback Tim Tebow helped the University of Florida win two national titles. 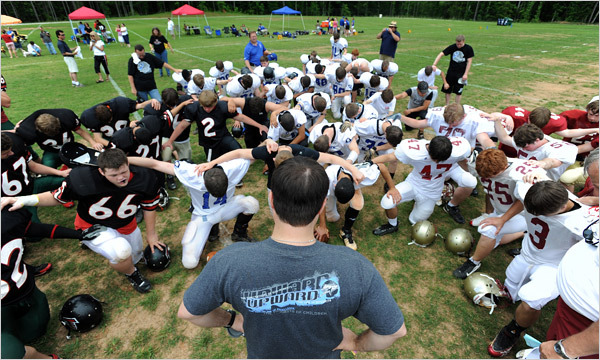 Tebow, who competed on a high school team, demonstrated that a home-schooler could absorb a playbook as well as the Book of Deuteronomy. The McDaniels said college coaches were unfamiliar with home-school teams and could be suspicious of grades given by parents. But a few Glory for Christ graduates have walked on to college teams, among them St. Denis’s son Michael at Georgia Tech and the McDaniels’ son Jordan at Tennessee-Chattanooga. One rising junior is Ben Allison, a strapping 16-year-old with the Georgia Force team, who embraces the emphasis on sportsmanship while wondering how he would measure up in a traditional setting. Ben is indebted to the Force. His parents lost their farmhouse and business, driving the family, which has 10 children, into debt. A teammate’s parent paid Ben’s $500 team fee — which included two overnight football camps — and another picked up expenses. Zach Walsh has benefited in another manner. Suspended by his public high school for drug possession, Zach was denied admittance to private institutions. Desperate to play football again, he was finally accepted by the Falcons. Coaches, volunteers all, sign a code of conduct that forbids tobacco products and cursing. Players utter the rare profanity after an error or a rattling hit. If the motivational technique seems unorthodox, it is all the 6-foot-2, 245-pound Owen knows. Until three years ago, his physical activity was confined mostly to ballroom dancing. “I didn’t know the 50-yard line from the goal line,” he said. Home-educated players lack access to on-campus training facilities. Gabe and Michael Jefferson, brothers who play for the Falcons, arise at 4:45 most mornings and endure two hours at a fitness center before their mother, Sandy, rings the school bell. Her sons yearn to play in college, and she dismissed their limited exposure to recruiters. “We have to make the most of the opportunity here,” she said. Given its grass-roots nature, home-school football may remain an off-the-grid activity even as it swells. Still, a national tournament took place last November in Panama City, Fla., and Roger McDaniel spent part of Memorial Day weekend there, drumming up support for a sequel. Three Glory for Christ teams participated in a recent Saturday jamboree in Ball Ground, about 50 miles north of Atlanta. Afterward, the players kneeled and bowed their heads. After amens all around, the congregation sang “Praise God From Whom All Blessings Flow,” then segued into a prayer. Finally, benediction. Time to head out and scrub up for church on Sunday. I did a story a few years ago on homeschool athletics after Butternut’s Russell Monroe and Lansing’s Kristi Veltkamp both were offered Division I basketball scholarships. At that point, there wasn’t a football option for those teenagers, but it looks like that might soon change. The following press release was submitted to our web site at the beginning of April. It doesn’t affect the great majority of our readers, but is still a little interesting. The Miami Dolphins’ Jason Taylor, for one, was homeschooled, although he was also allowed to play football at his local school. “A new football league is starting this fall across mid Michigan. The Christian Football League (CFL) of Michigan is not your typical football league. “‘There’s a need and an opportunity to provide homeschooled, private and charter schooled kids with the opportunity to play football.’ Boyd also sees an opportunity to make a positive impact on young people through this game. He’s seen the many different styles of coaching in his career and wants to provide a positive, high intensity and high integrity environment. “Parents and players have responded that this is an answer to their prayers. Because of the current laws, homeschoolers cannot play with local teams without enrolling in classes. And due to the cost, a lot of the smaller schools and charter schools don’t offer a football program. “The league has no affiliation with the Michigan High School Athletic Association and its teams cannot play MHSAA varsity teams. So the league will draw from teams from the Grand Rapids area, Flint area, the thumb area, metro Detroit and the Ann Arbor area. Lansing is also one of the proposed teams. “Plans for the first year are to have a state championship and All-Star Game and also participate in a national championship tournament in Florida. “It may start small, but hopes are to build the league to the level of some of the premier leagues in Georgia, Texas and Florida, where some of the players were recruited and are playing at the college level. The league will rely on much prayer and faith to get them there.